The District of Columbia sits on the fall line in the Potomac River Basin. The District is surrounded on three sides by Maryland and on its fourth side by the Potomac River that separates it from Virginia. The Anacostia River and Rock Creek both flow through the District where they join the Potomac River. The Tidal Basin is a partially artificial inlet designed to flush the Washington Channel, which parallels the Potomac River and joins the Anacostia River. The Chesapeake and Ohio Canal terminates in the District of Columbia. Although the District is small, covering only about 68 square miles, almost 10% of it (7 square miles) is covered by water. What is the maritime heritage of the District of Columbia? The maritime heritage of the District of Columbia extends back over 14,000 years when Native Americans moved to the area. The earliest people were semi-nomadic hunters and gatherers who supplemented their diet by fishing while later people lived in small permanent settlements along the rivers. Beginning about 1,000 years ago, people established large permanent villages near stream confluences and a horticultural economy. Captain John Smith of the Jamestown Colony is thought to be the first European to visit the area when he led an expedition to the Chesapeake Bay and up the Potomac River in 1608. Captain Henry Fleet of the Virginia Colony began trading with Indian villages along the Potomac River near the District of Columbia in 1627. 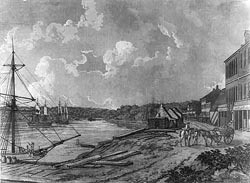 By the 1660s, tobacco plantations had been established in Colonial Maryland in the Blue Plains area along the Anacostia River, known then as the Eastern Branch of the Potomac. By the 1730s, there were plantations along Rock Creek and at present-day Georgetown, head of navigation on the Potomac River. Founded in 1751, Georgetown thrived as a port town trading in tobacco and other commodities. Hamburg was founded in 1763 as another trading center in the area known today as Foggy Bottom near where Rock Creek joins the Potomac River. The Washington Navy Yard was established in 1799. The Navy Yard was the largest ship-building and ship-fitting facility in the nation until 1814 when it was burned by the United States Navy to prevent capture by British forces. When the District of Columbia was established in 1790 as the nation’s capital, it included the port towns of Georgetown and Hamburg in Maryland and Alexandria in Virginia. A system of canals was designed to improve transportation across town as well as navigation on the Potomac River. The Patowmack Canal was the first to be built. 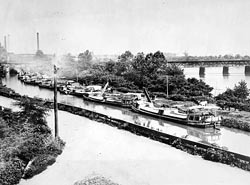 Later canals included the Washington City Canal, the Chesapeake and Ohio Canal, the Washington Branch of the Chesapeake and Ohio Canal, and the Alexandria Canal. Many boats used the canals but silting and damaging floods were constant problems. None of the canals were profitable and the last one ceased operations in 1924. Although archeological surveys are incomplete, the river beds in the District of Columbia have the potential to contain a range of underwater sites from prehistoric to historic times. The possibilities include shipwrecks as well as submerged remains related to bridges, canals, ferry landings, piers, and wharves. Who takes care of the District of Columbia’s underwater archeological sites? The Federal Government is responsible for underwater archeological sites in the District of Columbia because Maryland ceded its title to the beds of the Potomac River, Anacostia River, Eastern Branch, and Rock Creek, within the boundaries of the District, to the United States in 1791 for the District of Columbia. In the Potomac River, the boundary extends to the high water mark on the Virginia shore within the 1791 boundary. A number of Federal agencies own or have jurisdiction over these river beds including the General Services Administration, the Environmental Protection Agency, and the Departments of Defense, Interior, and Transportation. The District of Columbia Office of Planning plans all land use in the District and reviews zoning and historic preservation cases. Its Historic Preservation Office identifies, designates, and maintains an inventory of historic properties; reviews proposed actions that would affect historic properties; and promotes public awareness, understanding, and enjoyment of the historic environment. The work is accomplished in cooperation with the National Capital Planning Commission, the Commission of Fine Arts, and government agencies that administer historic properties or undertake activities that would affect historic properties. You need a Permit for Archeological Investigations from the appropriate federal agency to conduct archeological surveys and excavations on federally owned or controlled land. Permits are issued to qualified individuals at reputable museums, universities, colleges, or other historical, scientific, or educational institutions, societies, or persons for the purpose of increasing knowledge. Materials collected remain federal property and must be placed in a public museum or other recognized educational or scientific institution for permanent preservation. What laws concern underwater archeology in the District of Columbia? The District of Columbia Official Code has at least two sections that apply to underwater archeology: Section 102 in Title 10 that establishes and makes clear the title of the United States to lands or waters of the Potomac River, Anacostia River, Eastern Branch, and Rock Creek; and Section 1101 et seq. in Title 6 that codifies the Historic Landmark and Historic District Protection Act (Law 2-144). The District’s regulations on Historic Preservation are in Title 10A of the District of Columbia Municipal Regulations. Chapter 5 of this title covers Archaeological Resources. The Guidelines for Archaeological Excavations in the District of Columbia standardize the level of effort required and assure the quality of archeological investigations.